Whatever attention might come Hagen Danner's way, he figures he can deal with it. Be it scrutiny as he tries to master tools needed as a catcher with the Bluefield Blue Jays or any positive attention he generates at the plate, he has a plenty of experience to fall back on. After all, he's been in the spotlight on the baseball diamond for years. "To this day, the Little League World Series is still probably the thing that has been the greatest fun for me," Danner said. "There was just so much going on with that." Danner's role was big as the Huntington Beach, California-based Ocean View team won that youth championship. And it just kept building as he climbed through the amateur ranks. There was a major role on a league championship high school team in his hometown -- alongside first baseman Nick Pratto, who was also a Little League teammate on that 2011 team. Then more attention came their way. Pratto was a 2017 first-round Draft pick of the Kansas City Royals, while Danner went in the second round to Toronto. "We had a lot of fans at our games and a lot of [scouts] coming to watch," Danner said. "We were just used to it by then. With [Pratto] drafted as high as he was, that was great." Danner opted to sign last summer, setting aside a scholarship from UCLA. He had been scouted as a pitcher and catcher, but he's identifying as a catcher at this stage. The connection between Danner and Pratto remains tight. Pratto indicated that they saw each other just about daily during offseason workouts. "We're each other's biggest fans," Pratto said. "We've played with each other for a long time. We went through some of the same things. That helped a lot for me." Pratto has made a faster rise in the professional ranks, playing for the Lexington Legends in the South Atlantic League this season. Last month, he was named the Most Valuable Player in the South Atlantic League All-Star Game. 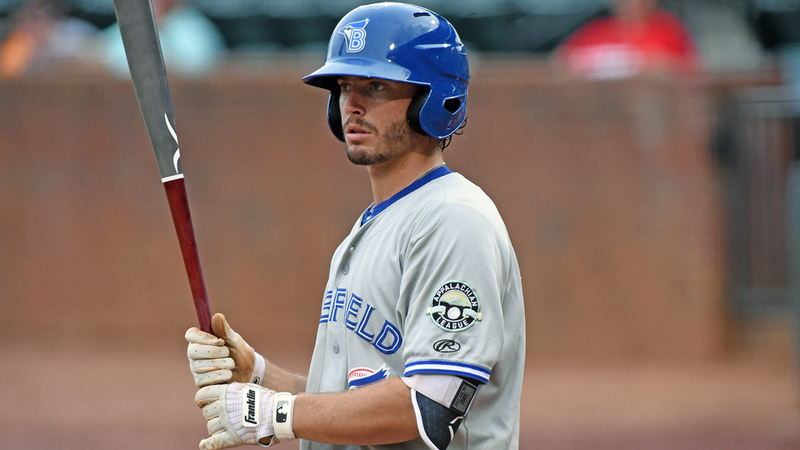 On the same night, Danner, 19, was making his Appalachian League debut for Bluefield. He spent the 2017 season in the Gulf Coast League. "He needs a lot of at-bats," Bluefield manager Dennis Holmberg said. "His bat will come along in due time." By the start of July, Danner was riding a five-game hitting streak and already matched his 2017 total of walks with five. Danner said he has concentrated so much on catching duties that the hitting still needs to come around. "I haven't seen him play [as a pro]," Pratto said. "I know the numbers will start popping because that's the type of player he is." Less than a week into the season, Danner was behind the plate on a night when the Blue Jays took a no-hit bid into the ninth inning. They ended up one out away from completing that gem against the Burlington Royals. For Danner, there was a sense of accomplishment in being involved. "Everyone was connected," he said. "The pitchers were aggressive. It was a lot of fun, and made the game go pretty quick." While it was early in the season, Holmberg got a good glimpse of Danner's abilities. "You have a kid who came to us out of high school and he was a two-way kind of guy," Holmberg said. "He has a strong arm back there. He's got the toolbox to be a good catcher." Coming in pairs: Pulaski Yankees third baseman Nelson Gomez, a 20-year-old out of the Dominican Republic, has collected 24 career home runs across parts of four pro seasons. He notched his third two-homer game (and first of the year) on Sunday with a pair at Kingsport. Give him a bat: Princeton Rays outfielder Jordan Qsar followed his first career three-hit game with a four-hit outing the next night. Among his college duties for Pepperdine, he was a reliever. "I closed every season I was at Pepperdine," he told the Bluefield Daily Telegraph. "I want to hit first, so that is what they have got me doing." One to remember: The Burlington Royals won only twice in their first dozen games, with the first managerial victory for former big-leaguer Brooks Conrad coming in the seventh game with an 11-10 decision against the Danville Braves. It ended on left fielder Montae Bradshaw's ninth-inning diving catch. "We've already been through enough adversity to last a season," Conrad said. "Maybe it was fitting we had to make a diving play to even win that." Bob Sutton is a contributor to MiLB.com. This story was not subject to the approval of the National Association of Professional Baseball Leagues or its clubs.